Direct and Indirect Spirit (Zheng-shen and Ling-shen) is a confusing topic for many students of Feng Shui and that is because there are many layers and many ways the terms are interpreted, the classic said,“The real key to understand Ling Shen and Zheng Shen is that water is considered prosperous when it is declining and mountain is considered prosperous when it is timely”, and it gives a suitable frame of reference for XKFX Indirect and Direct Spirit. The first is a fixed pattern based on the Luoshu, so for example in Period 8 the Zheng Shen is in the NE (8 Gen Gua) and in this direction it should have a mountain or be higher or has less activity and to the opposite the SW (2 Kun Gua) is the Ling Shen where it should have water or be lower or has less activity. In a way Ling Shen and Zheng Shen in this fixed pattern is about Yin Yang adding up to 10, so the complementary opposites are working together not only in numbers but in form. But a fixed pattern without taking into consideration of a built form is contradictory to the working of the Yili principles (the only constant is change), so in XKFX there is also the second non-fixed Ling Shen/Zheng Shen arrangements and we can find them in the Wang Shan and Wang Xiang (Prosperous Mountain and Prosperoud Facing) charts, where the timely mountain star is located at the sitting direction and opposite to it is the timely water star at the facing. In these charts, the timely mountain is the Zheng Shen and the timely facing is the Ling Shen, and the external forms should support the stars likewise as for the fixed patterns, but it changes for each construction period as well as for sitting and facing. It would be double good if the fixed pattern is support by the non-fixed pattern but what if it is not the case, then a fixed pattern would not have the earth configuration to match the timely stars to make it more desirable and a non-fixed pattern would not have the Luoshu Yin Yang adding up to 10 at the Earth Plate to make the Heaven Plate perfect. The third type of Ling Shen/Zheng Shen is the Form or Xingshi configuration where the sitting direction should have a mountain and the facing direction should have water to make the Yin and Yang of the physical form come together. If it is not possible, that is if the sitting has water or is lower or more active while the facing has mountain or is higher or less active, then it is not desirable and we will need to modify the form to suit, in the more immediate or the micro-environment. All these three types of Ling Shen/Zheng Shen work on the idea of balancing the Yin and Yang at the sitting and the facing of a house, in a general and undifferentiated situation (the first type), in a specific and differentiated situation determined by the time of construction and the directionality of the house (the second type) and in the Xingshi (Form and Configuration) of the environment (the third type). If we can use this as a frame of reference then we can see how the other systems varied from the Xuan Kong Feixing standard, but it is not to say that XKFX is better, but it has a theory to its mechanics and we can use them to compare with others like XKDG, which not only have Ling Shen (also called Zheng Shu 正水) and Zheng Shen but also the Hasten Wealth Water 催財水, the Hasten Officialdom Water 催官水 and the Auspicious Reflected Water 吉照水 as well and on top of this the cycles of time are correlated in a different way (Er Yuan Ba Yun 二元八運 instead of San Yuan Jiu Yun 三元九運). Again, we need to be careful not to mix them up when the theory for correlation is different from one to another, leading to a different mechanics for a different system. What is even more confusing is another new Xuan Kong system, the XKLF School arrive at their Ling Shen and Zheng Shen with a different interpretation of the classic, below is their rationale for the mechanics. LF used where the 5 Yellow Large Golden Dragon (Wuhuang Dajinlong 五黃大金龍) is located on the Luoshu as the standard reference point, to work out where the two groups of Ling Shen and Zheng Shen are located, so there is one group or Pian 片 for the Upper Yuan and one group for the Lower Yuan, one group for Yin and one group for Yang, one group for Mountain and one group for Water. 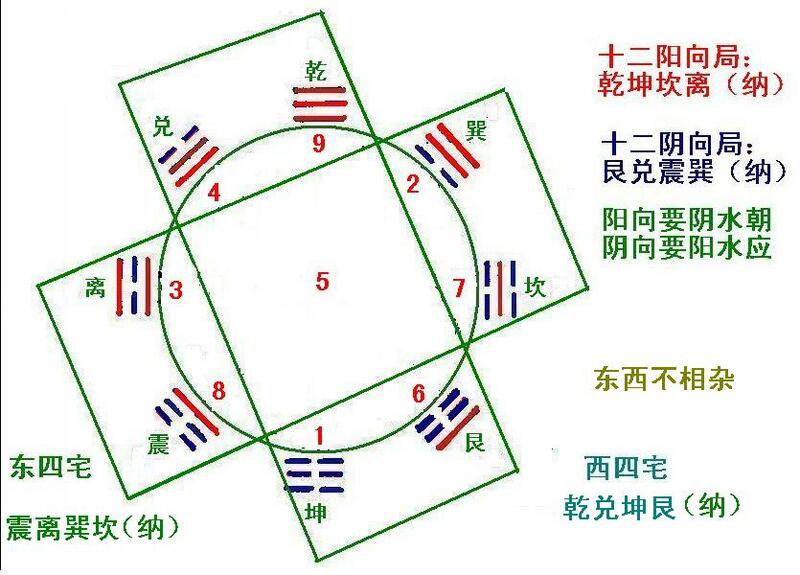 For the current Period 8, 8 is a Yin number so 8 flies reverse and we get the 5 Yellow located at the Later Heaven Gen Palace, which has the Early Heaven Zhen Gua. Those belonged to the same group as Zhen, that is Qian, Kan and Gen (Yang Guas), are correlated to Ling Shen and their opposite Kun, Xun, Li and Dui (Yin Guas) are correlated to Zhen Shen. When we locate them on the Later Heaven Luoshu, we get the location for the Ling Shen and Zheng Shen as mentioned in the previous post. The Yin Guas are Mountains (Zheng Shen) and the Yang Guas are Water (Ling Shen) because water is active, when viewed from a movement point of view, therefore it is Yang and mountain is passive, therefore it is Yin.